Funeral services for Pina Gibson, 97, were held December 4 at the McRoberts Old Regular Baptist Church. 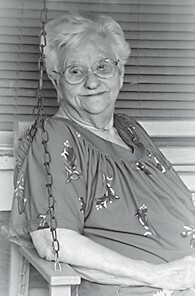 She died November 30 at her home, also in McRoberts. A daughter of the late Lorenzo Dow and America Johnson Branham and the widow of Ed Gibson, she is survived by two sons, Denvil Gibson of McRoberts and Terry Gibson of Banner; seven daughters, Ethel Pacheco of Garden City, Mich., Betty Dailey of Morristown, Tenn., Nellie Smiley of Westland, Mich., Rosezella Calica of Virginia Beach, Va., Dianna Fallon of Georgetown, Nancy Nipper of Lake Springs, Va., and Brenda Parrish of Baltimore, Md. ; a brother, John Branham of McRoberts; two sisters, Lucy Anderson of Ypsilanti, Mich., and Joanna DeBruhl of Michigan; a stepbrother, Willie Burke; and a number of grandchildren, great-grandchildren, great-great-grandchildren. Four children — John Dow Gibson, Deanie Gibson, Shirley White and infant Lila Gibson — and brothers and sisters Jack Branham, Jonas Branham, Patton Branham, Hattie Hughes, Esther Potter, and Odell White, preceded her in death. Burial was in the Branham Cemetery at McRoberts. Letcher Funeral Home, Whitesburg, had charge of the arrangements.